Home / Blog / Silver Mirror’s Pro Skincare Regimens – Christina C.
Everyday, we have a steady stream of guests from skincare veterans to skincare newbies asking our team members the same thing: what do you use on your skin? This is a blog series dedicated to that simple, yet very complex question. 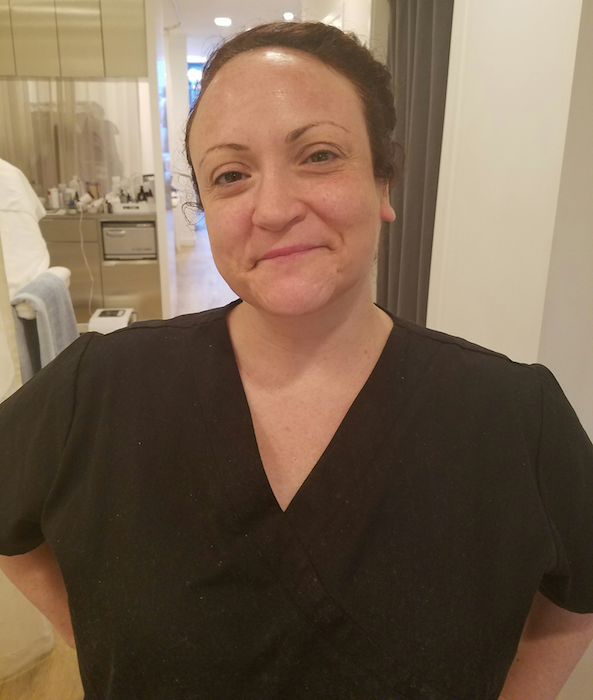 Silver Mirror Skincare Pro: Christina C.
I keep my routine pretty steady but occasionally I will introduce a more active ingredient, such as Retinol, a couple of days a week to trick the skin so it doesn’t become unresponsive. I like the brand Simple for my basic cleanser and Sanitas glycolic cleanser for something more active. After cleansing I will always follow with antioxidant protection as I believe, besides sunscreen, it’s the most important thing one can do for age prevention. SkinCeuticals is the best! I ALWAYS use an eye cream. Currently I’m using the Peptiderm from Sanitas. It’s great for elasticity and collagen synthesis. Then a Vitamin C moisturizer to help with pigmentation and I NEVER forget SPF 50! Double cleanse, 1st to remove makeup, the 2nd to cleanse the skin. On the off days from Retinol, I’ll follow with the IS Clinical Youth Serum to hydrate, soften, and prevent future lines and wrinkles. Vitamin C Eye Serum also from IS Clinical to brighten and increase collagen under the eye area followed by a Bee Venom eye cream to firm. Finally, I just started using the Youth Complex Moisturizer also from IS Clinical and am loving how hydrating and smoothing it is.